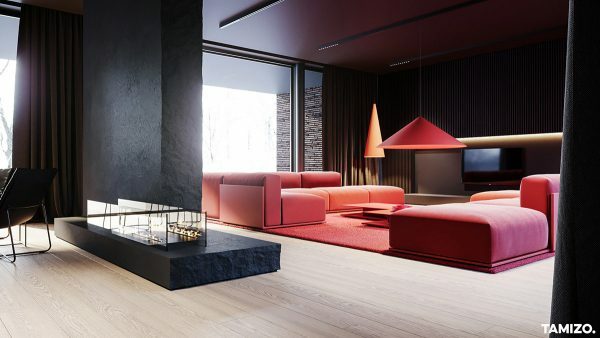 The modern fireplace is of a linear design, set upon a black hearth with a rugged edge. 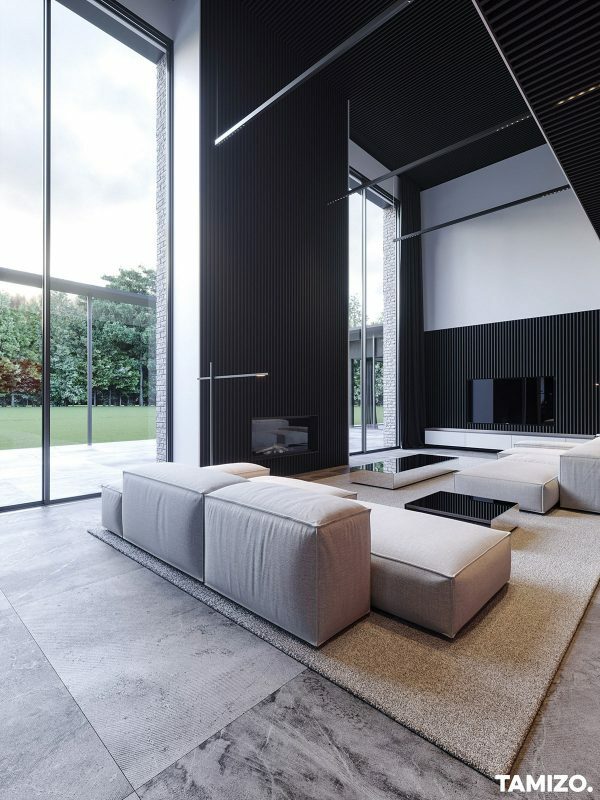 A black wall partially divides the lounge from the dining room, and obscures part of the fireplace from view of the sofas. 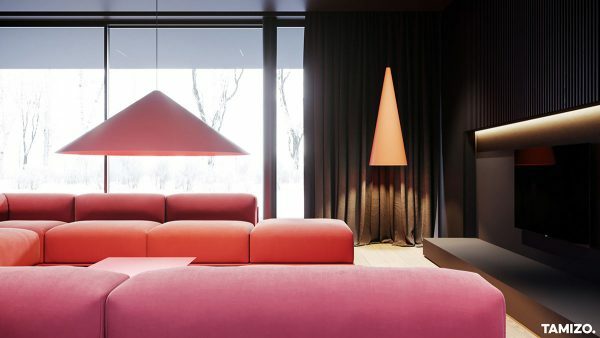 An unusual floor lamp lights up the charcoal coloured drapes. 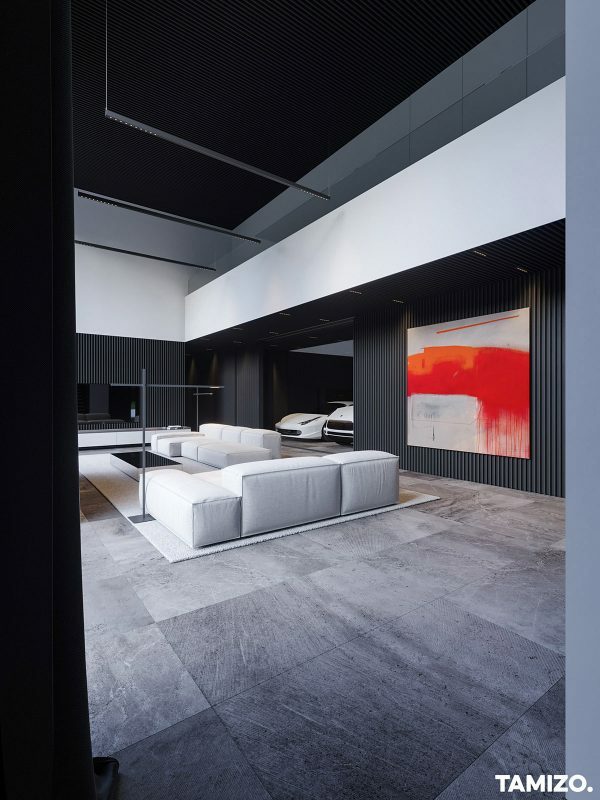 LED strip lights illuminate the underside of a black slatted wall panel that frames the tv. 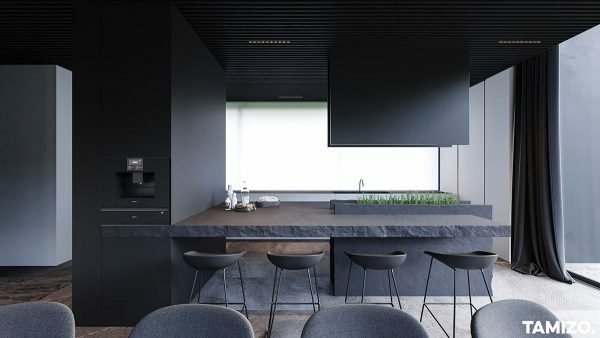 More modern dark interior design shapes the adjacent kitchen dining area. 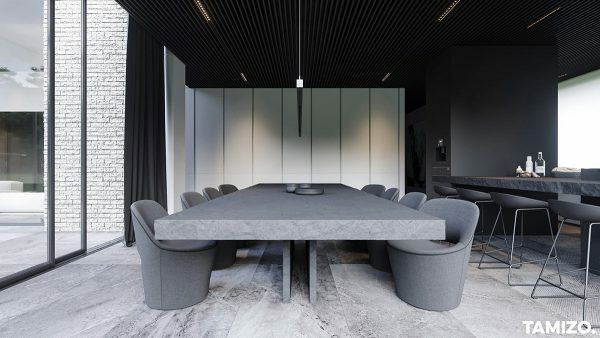 Huge pendant lights hover as giant black cones over a black dining table and grey chairs. 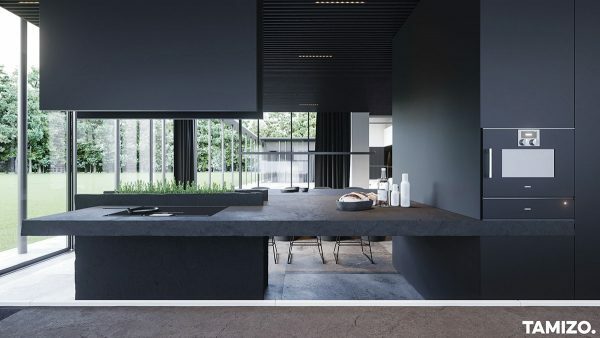 A charcoal coloured kitchen looms darkly behind the eating area. 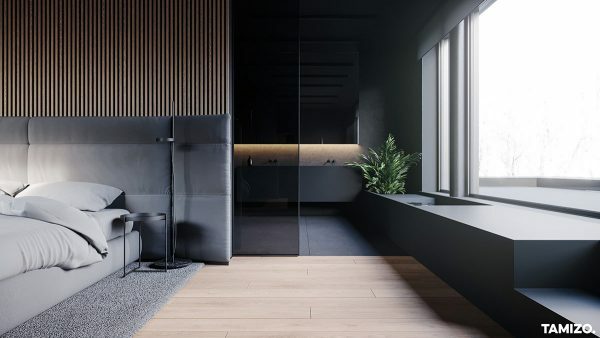 Wood slat panels and doors lighten the look of the dark decor at one side of the open plan room. Red wall art punctuates the end of the hallway. 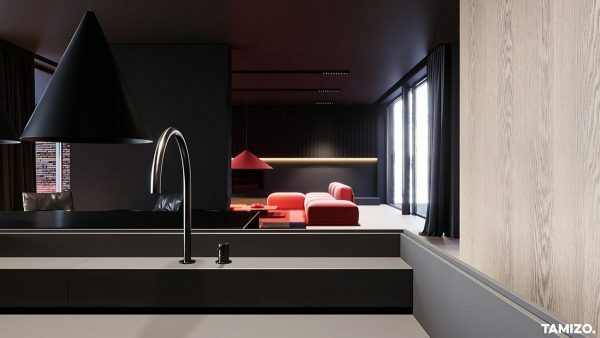 A modern grey kitchen sink is sunken into the central island. 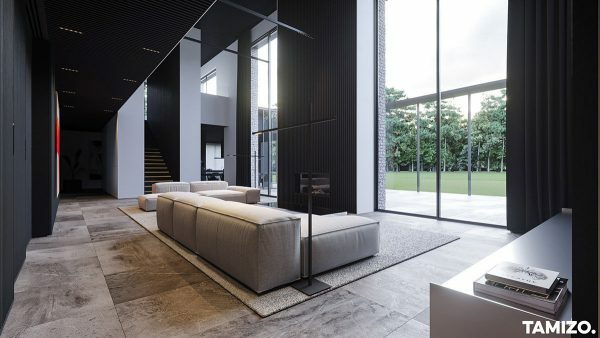 A black staircase design rises up through the hall, with black metal balustrades drawing vertical lines all the way from the treads to the ceiling. Daylight peeps through the spindles from full height windows behind. Huge planters grow a couple of plants inside the glass. 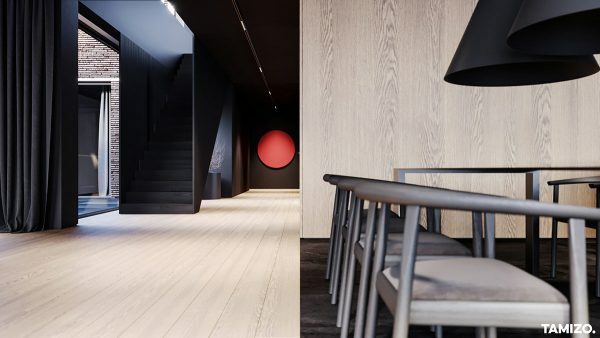 Across from the modern staircase, a red pouf sits in front of a large wall mirror. 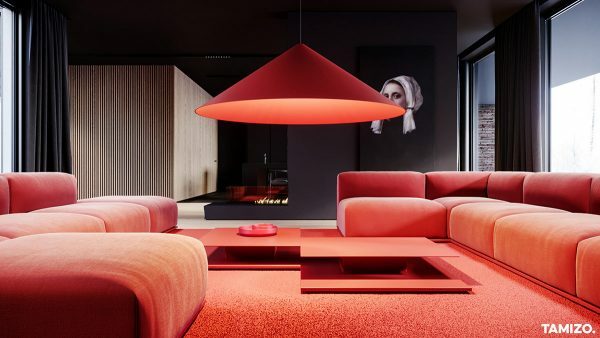 The pouf matches the sectional red sofas in the lounge. 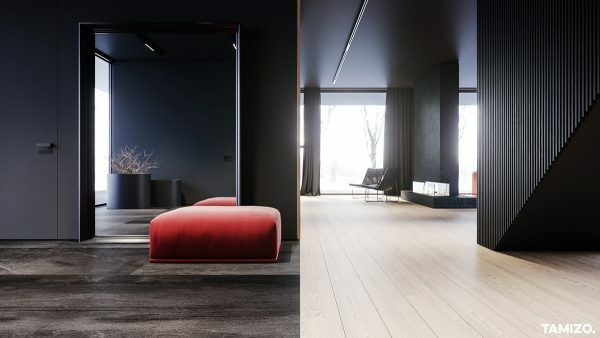 These two areas are marked as separate by a change in flooring design – one being covered in light beechwood planks and the other finished in a wide dark tile. 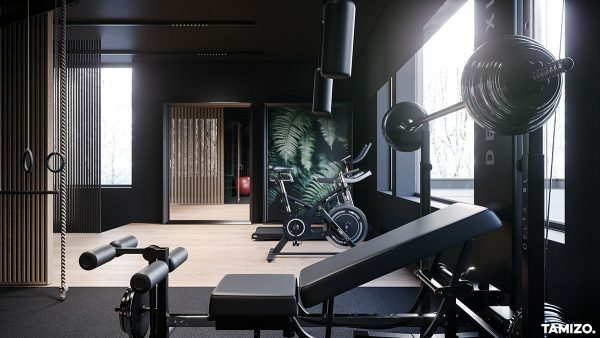 The master bedroom has a completely grey and wood decor scheme, aside from a burst of green coming in with mature indoor plants. 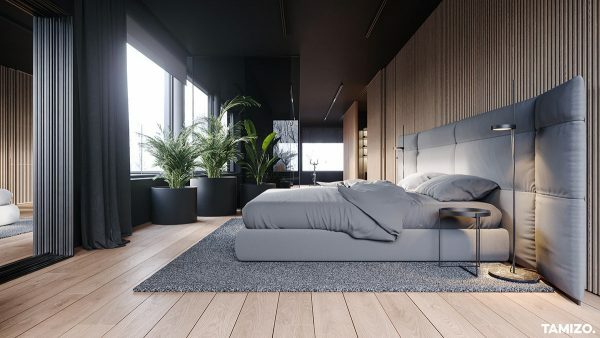 A grey bed and padded headboard design is set on top of a grey bedroom rug. Long grey drapes pool at the window. 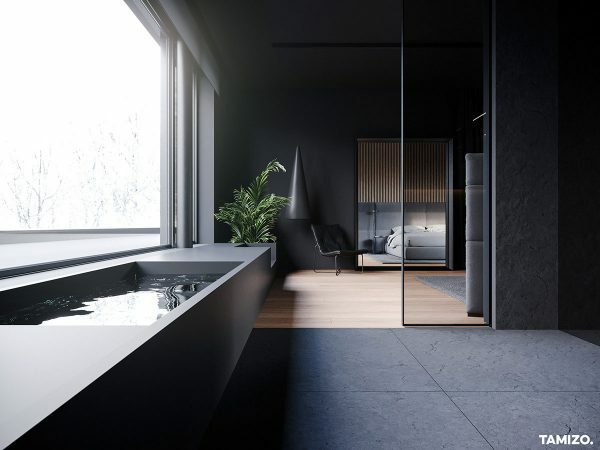 A glass wall ensuite bathroom follows on with the grey theme, with a grey double vanity unit and grey flooring. 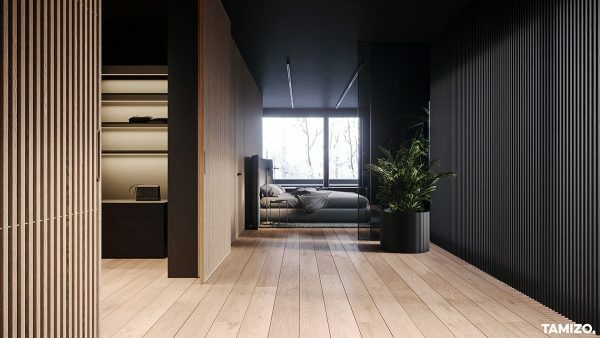 On the way to bed, there is a luxury walk in closet hidden behind wood slat panel doors. 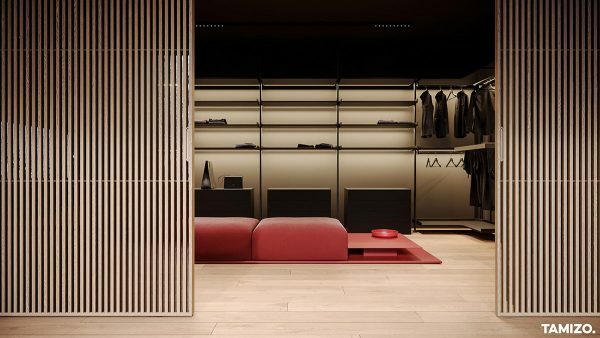 The double slatted doors slide apart to reveal a wide array of garment rails, shelves and drawers. 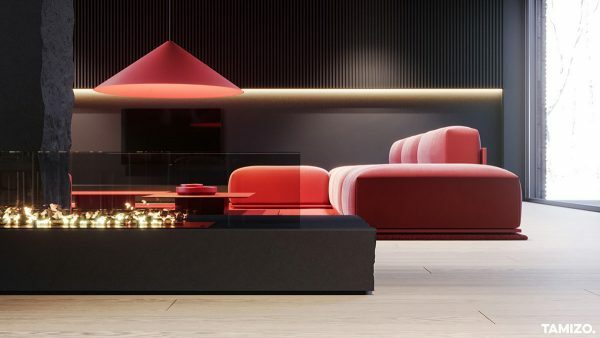 Red seating is lined along the middle of the space. 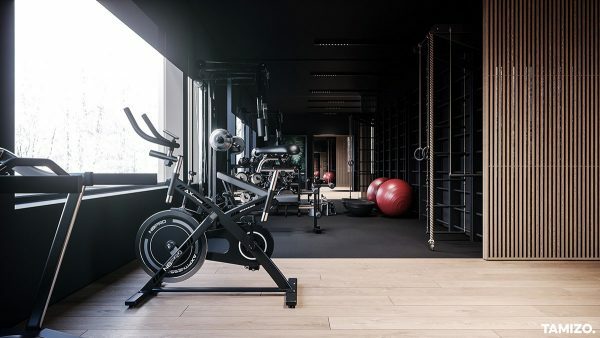 Even the home gym gets a splash of red, in the form of a red balance ball. Green botanical art provides contrast. 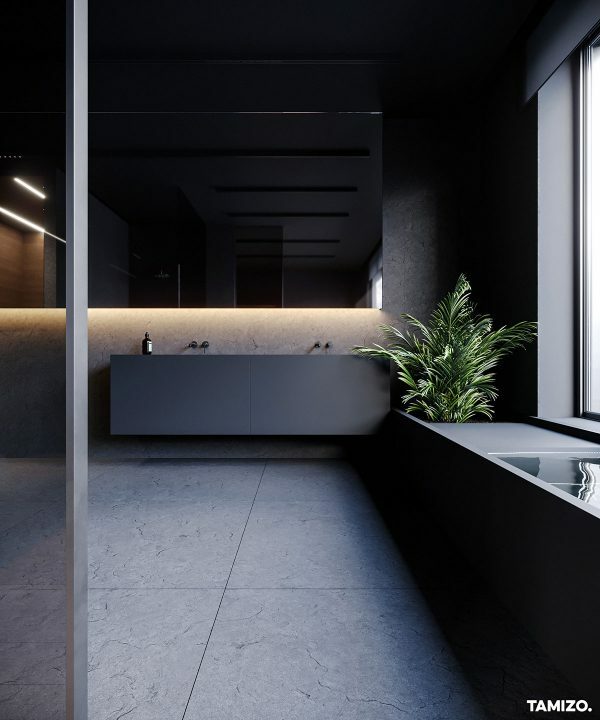 Inside the ensuite, textured grey floor tiles match rugged grey walls. 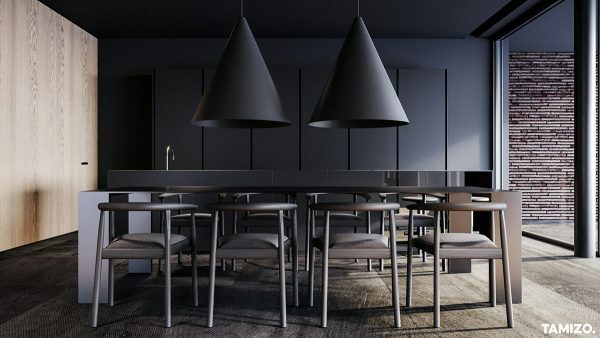 Mirrored cabinets are underlined with mood lighting in the shadowy scheme. 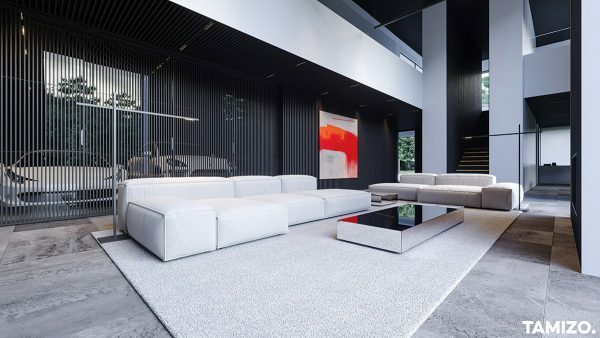 Our second tour features a modern living room for car lovers. Red artwork has been hung on the wall to vie for attention, but whether the slatted doors are opened or closed, it’s the collection of sports cars that wins the award for showstopper. 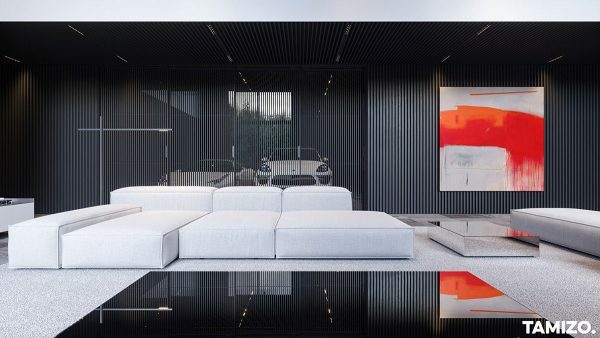 A white sofa stretches out in front of the white sports cars, joined by another at its side. 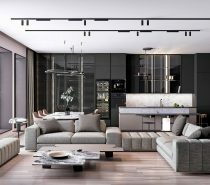 Mirrored coffee tables sit in front of each designer couch, reflecting the light from huge windows opposite. 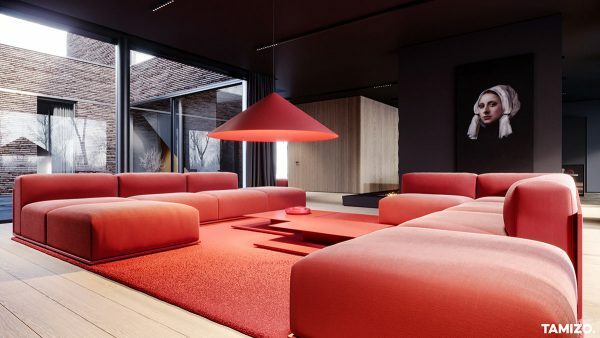 A cool floor lamp joins each of the sofas too. Green garden views contrast with the red wall art in the room. 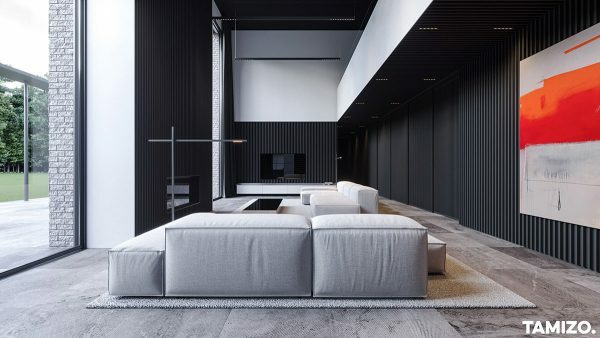 A grey area rug holds the whole lounge furniture arrangement together as one cohesive connected area. 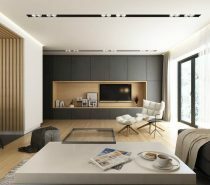 A black slatted panel creates a commanding backdrop behind the tv. A white media unit cuts across the dark feature wall. 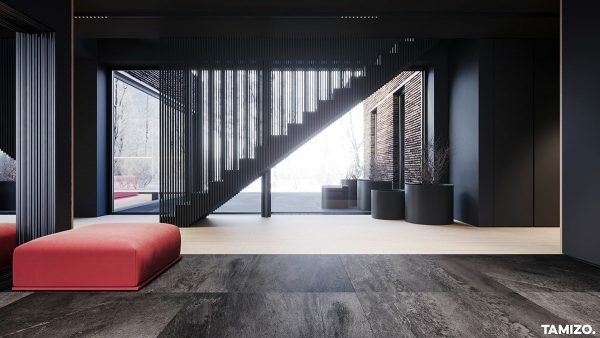 More black slat panel work draws attention to the chimney breast that rises up to the rafters in the room, setting off a modern fireplace. 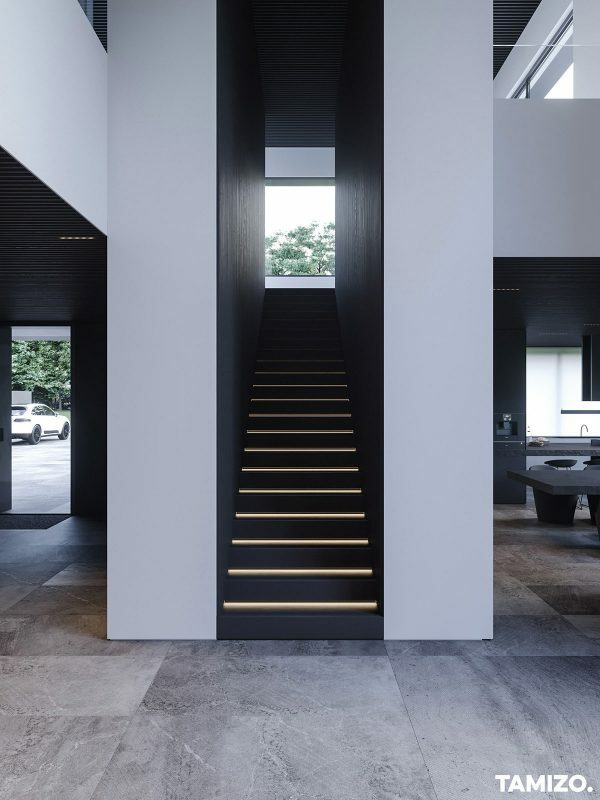 LEDs illuminate the treads of a dark staircase design. 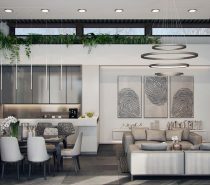 The luxury dining room contains a huge grey stone table and chunky grey dining chairs. 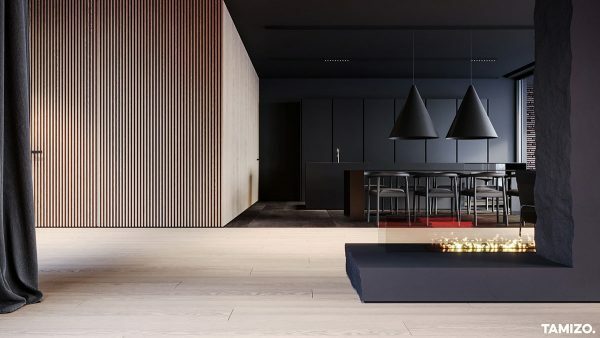 Black slatted panels cover the dining room ceiling, with track lights twinkling through. White kitchen cabinets brighten the border of the room. 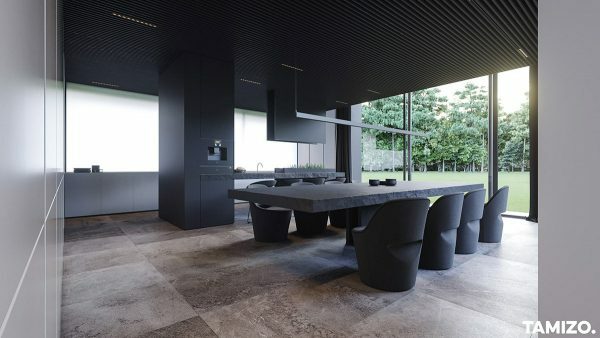 The kitchen’s dining peninsula matches the rugged cut of the stone dining table nearby. The peninsula support leg is created by a linear planter design that rises up through the countertop. 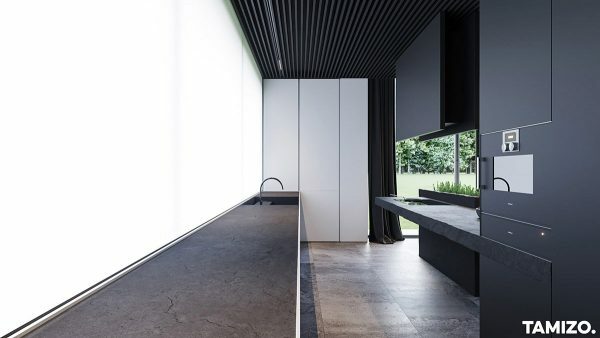 One wall of the galley kitchen is a lightbox, glowing over the prep area and the grey kitchen sink. 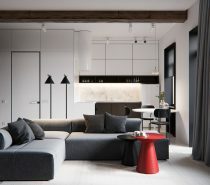 The units that meet with the kitchen peninsula are dark grey to match, with colour coordinated integrated appliances. 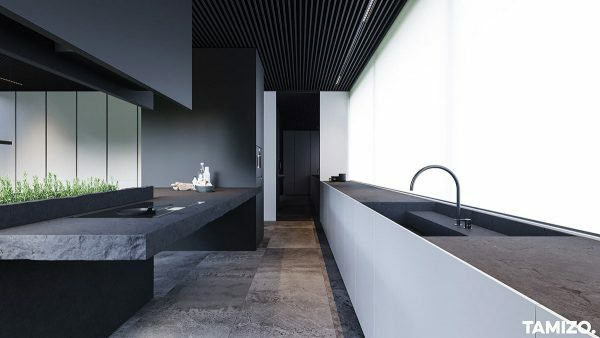 Dual aspect green garden views bless the monochrome kitchen design.